This afternoon you’ll learn how the town of Alice Springs has evolved into the central hub of the Australian outback. Your Driver Guide will provide details along the way as you visit historical sites and some of the essential services delivered from Alice to the community of this vast region. 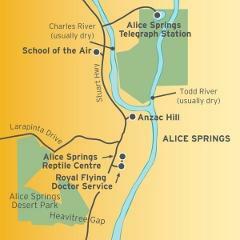 Established by the early explorers, Alice Springs began as a repeater station along the Overland Telegraph Line. Overflowing with history and heritage, Australia’s most famous outback town is now the central headquarters to a range of services and a thriving tourism industry. The traditional custodians, the Arrernte people, refer to Alice as ‘Mpwante’ and a wander through the centre of the town will introduce you to their traditions and stories. Established in 1951, the Alice Springs School of the Air provides education to primary aged school children living on remote properties throughout the Northern Territory. You’ll learn how this essential service is delivered via satellite across more than one million square kilometres. Built in 1872 to relay messages between Darwin and Adelaide, the Telegraph Station is the site of the first European settlement in Alice Springs. After 60 years of operation, the premises then served as a school for the local Aboriginal children. Now a historical reserve, featuring the original stone buildings and furnishings from the early 1900s, the Telegraph Station is a must to visit and learn more of the history of the Alice. Now you’ll visit the home and headquarters of the highly respected Royal Flying Doctor Service. 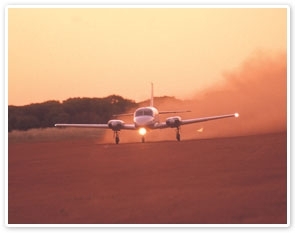 Delivering medical services to people who live, work and travel in remote and rural Australia, the RFDS is a critical resource for this community. Learn of its remarkable history through stories, images and their wonderful interactive museum. Home to the largest reptile display in Central Australia, the Alice Springs Reptile Centre will introduce you to Terry the saltwater crocodile and let you get very close to enormous goannas and frill-neck lizards. The Gecko Cave features a large collection of gecko species from all over the Northern Territory. You’ll have lots of fun here, particularly during the afternoon show and if you’re game, try the supervised handling session. Last stop – Anzac Hill. Originally dedicated to the many men and women who lost their lives during WWI, it now honours all those who have served in wars that Australia has played a role.